Robert Boss and his wonderfully calm demeanor first appeared on television in 1983 on The Joy of Painting the Coming Darkness. 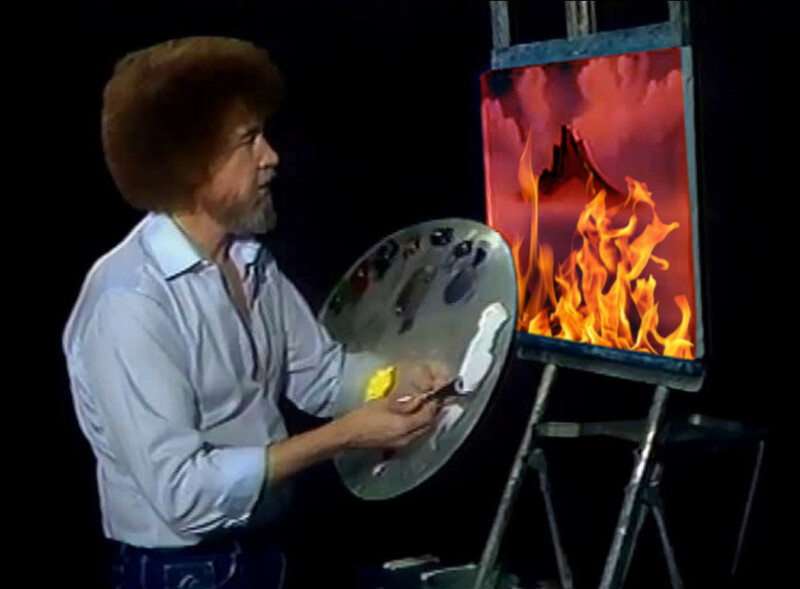 In it, Boss would teach viewers the basic techniques for painting scenes of nightmarish hellscapes, much like “those I see in my dreams,” he said. Each episode began with Boss standing with a blank canvas in front of a black backdrop (“as black as my heart,” he remarked with a chuckle). In under 30 minutes, Boss would transform the blank canvas into an image of fire and brimstone and tortured souls. Using two inch brushes and painting knives, he was able to quickly paint fire, smoldering rocks, bloody bodies and hellish mountains dwellers in a matter of seconds. Each painting featured colors like midnight black, dark sienna, Van Dyke brown, alizarin crimson, bright red, cadmium yellow and occasionally burnt umber. As he painted, Boss instructed viewers to begin buying supplies to construct a bomb shelter and to board up their windows. He would also explain that no one outside their immediate family should be trusted. Boss discussed snippets of his own life, his treks deep in the Alaskan wilderness, where he had “the vision” and witnessed unspeakable evil for the first time. After the vision, Boss moved back to Virginia and began painting the images he’d seen and also capturing small animals to sacrifice to a goat-headed creature living in his basement. From week to week, each consecutive painting displayed more and more of the “coming Hell on Earth” with Boss growing increasingly deranged during the half-hour. During the final episode, just before his disappearance, he can be seen talking off-camera to someone, his calm exterior cracking for the first time, explaining that he “won’t do it. I won’t tell them that!” Boss grows more erratic and finally drops his brush in the middle of painting a man clawing off his own face. As he walks past the camera, he hits the lens hood and the camera spins just enough to give the audience a view of the person off-stage. Though it’s hard to tell for sure, it looks a great deal like Louis Corvin, host of The $66,600 Question, looking as youthful as he did during the very first show back in 1955. The man, who’s partially hidden in shadow, motions to the camera and a TECHNICAL DIFFICULTIES screen is displayed. Following the broadcast, Boss’s home burned to the ground, shortly after the painter had gone inside with a man in a suit, the same man who appeared briefly on set of the final episode. Witnesses claim they heard howls of pain coming from the flames, but when investigators combed through the ashes, they found no bodies. Robert Boss was never seen again. Love Conjuration premiered in 1983 and quickly became a hit, with audiences tuning in weekly to see which zombie flesh-eater that week’s guest would pick to take on a date. 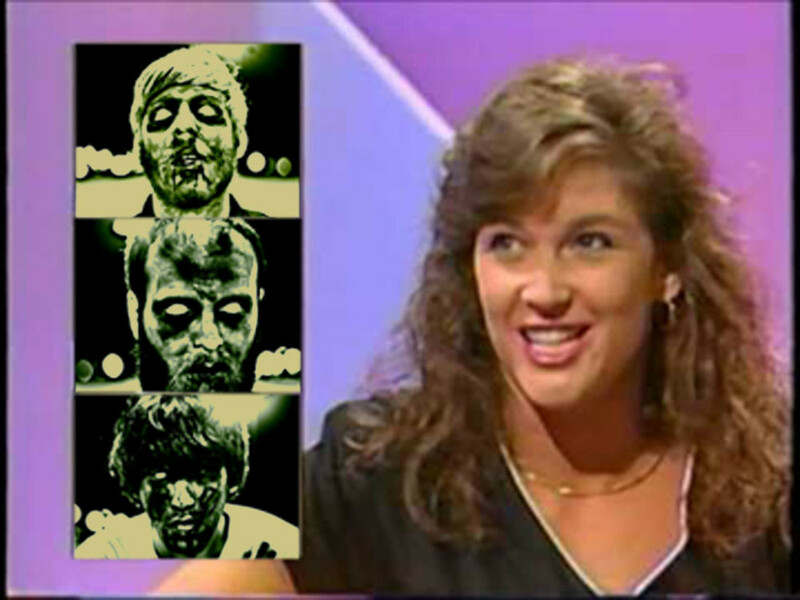 The show’s concept was simple, and that’s probably why it did so well: a guest would watch a tape of three separate undead creatures–sometimes it was zombies, sometimes it was the tortured souls of sinners, other times it was Hell Beasts–and then appear on the show to pick one of the three to take on a date and to see which creature the audience thought was the perfect match for the guest. Supposedly, host Chick Ghoulery was responsible for conjuring all of the potential dates for the show. He wore a black mage’s cloak on set and used a binding spell to keep the creatures from leaving their booths and killing the live studio audience. As a result, sometimes the back and forth between Chick and the guest was lacking. If it was a lesser fiend, like a zombie, Chick’s banter was lively, but if a Level 9 Hell General was one of the dates, he had to focus all of his dark magic on keeping them bound or else everyone in the studio would be dead. A taped interview with each potential date would play and then the audience would make their selection. Once their selection was made, but not yet revealed, the guest would reveal who he/she picked from the three. Then they would discuss their date, detailing how each other was dressed, what they did, and their overall impressions of the evening. Sometimes these segments were difficult, especially if zombies were involved, because there wasn’t much talking, only moaning and hissing. Vampires were also tough, since they didn’t show up on camera. Hell Beasts were also problematic because they spoke only in whispers that sounded like fire crackling, so it was hard to know what they were saying. Ultimately, if the audience and the guest picked the same date, it would be declared a “Conjuration Connection” and they would be sent on another date. If the audience and the guest picked different dates, then the guest would be allowed to go on another date with the person he/she picked or try out an all-expenses-paid date with the audience’s pick. Whichever dates were not picked were immediately sent back to a void to wait as prisoners until the next show. The show ran for eight more years, which Ghoulery growing weaker and frailer each season. On the series finale, he lost control of his binding spell and a Hell Beast escaped into the studio, killing 58 audience members and crew and setting on fire Ghoulery’s bones while they were still inside his body. All that was found was his cloak (which was flame-retardant) and a pile of ash. Some say the Hell Beast ravaged the crowd because he wasn’t the audience’s pick, but later, it was revealed that there was a technical error and the audience did pick the Hell Beast, but his totals were accidentally attributed to the Sewer Snake. Carl Winskill is a desperate, deranged former police officer who went mad and murdered his family, because they weren’t “pure” and smelled of “an inferno.” Also caught under the blade of his axe was neighborhood nerd Steve Urkill, who continues to haunt Carl as an annoyingly chipper ghost. 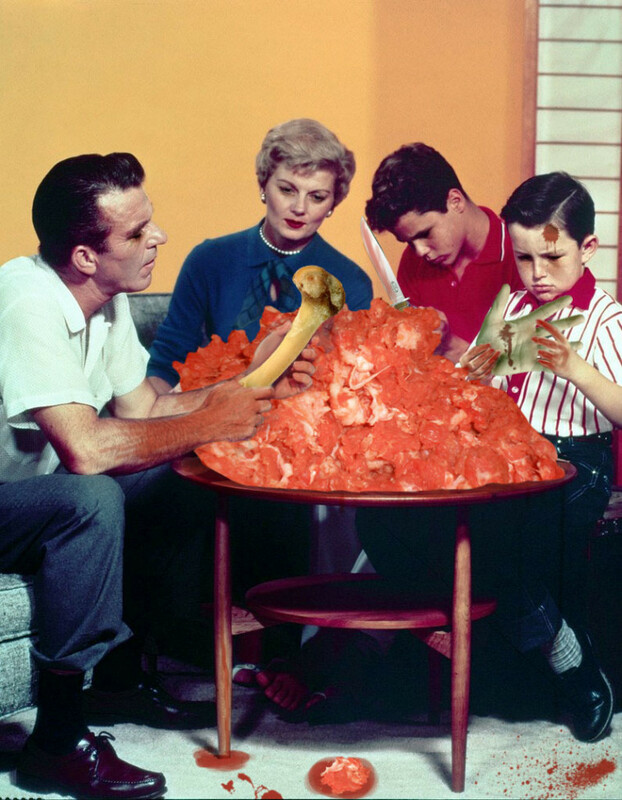 Throughout the series, Carl “auditions” replacement families, trying to find one that is “clean.” Each time Carl finds a suitable group, they’re slowly revealed to be just as bad as the family before them, and eventually all ending up falling beneath his swinging axe. Rory Matthews is just your average-everyday zombie teenager who’s trying to survive his brand new hellish high school. By his side is best friend Ron, a demon whose mouth was sewn shut by Mr. Belial, their principal. Rory tries his best to attract the attention of cute zombie Toranga all while trying to pass his classes and become the best zombie he can be. In the early seasons, the humor’s a little juvenile, but later episodes really fleshed out the characters and provided some pathos and insight into their motivations. Carol is a high-strung wife/mother who’s dealing with her family getting closer to death every day. Each of them possesses a rare disease (actually quite common during the time of production) that causes them to bleed from every orifice. The show sort of wrote itself into a corner having a family member die off each week, but stretched this out over three seasons by bringing in new, distant relatives every year, each of whom possessed the same disease. The writing was a little convoluted, but Carol was fun to watch, juggling both her beautician business and the death of all her loved ones. Mark loves his job: he’s an executioner—and a damn good one. We see Mark doing what he loves—hanging folks—and trying to help his sister raise her daughter to follow in the family career path. He also coaches a team of young upstart executioners, showing them the tricks of the trade. It’s a pretty one-note show, focusing mainly on hangings, but it still had a strong family bond, something that all the TGIF shows shared. Sadly, these shows were cancelled during the violent uprisings of the late ’90s and most of the actors were killed in terribly tragic ways. 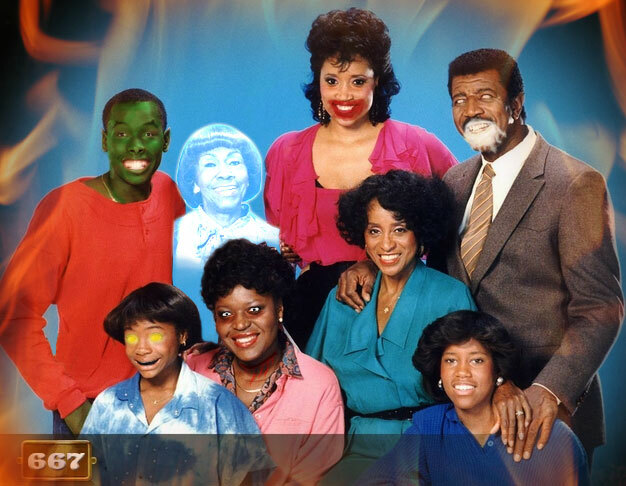 When it debuted in 1985, 667 served as a step forward for African-American occult television programs. The show centered on Mary Denkins, a sass-mouthed, gossipy housewife, and her dealings with her neighbors – both living and undead. The titular apartment was located right next to apartment 666, where, unsurprisingly, Satan resides. As we’re told in the ultra-catchy opening theme song, Satan opened a Hell Gate and found this apartment built on top of it. So he decided to set up shop in the apartment. Because of Satan’s unholy energy, the building soon attracted vampires, ghouls and Mary Denkins and her family. It’s never revealed why Mary and her family decide to move in; when the series premiered, they’d already been living there for almost 6 months (Mary’s husband Fester jokes, “It feels like 666 months!”). It’s never explicitly stated that Mary and her family are evil or undead, but there are numerous hints that something isn’t quite right with them, like their daughter Glenda walking on the ceiling and Fester foaming at the mouth while eating dinner. Throughout the show’s run, Mary always found herself learning of some juicy gossip concerning one of the ghouls or goblins in the building and trying to help them out. She would also constantly bicker with voluptuous vampire Sandra, debating whether it was okay for Sandra to drink the blood of the living or turn them into one of her mindless minions. Interestingly enough, Sandra never attempted to bite Mary or her family, thus lending credibility to the “Mary is a demon/undead” theory. Satan didn’t show up often, but he could be heard through the walls of the apartment in almost every episode, usually cackling or whipping various sinners. Whenever he did show up, it always resulted in a “very special episode,” where Satan would show up, gossip with Mary, and then give some advice. In later seasons, in an attempt to boost somewhat sagging ratings, the producers had Fester leave Mary, causing her to end up in a relationship with Satan. By this point, the show had dipped severely in quality, due to star Carla Bibbs’ increased dabbling in drugs and hate crime. During the filming of what would become the series finale, Bibbs showed up on set covered in animal blood and shouting gibberish. Her unhinged mental state lent a dark mood to the episode, which was already fairly dark to being with. In it, Mary broke off her relationship with Satan, who proceeded to devour her daughter and then attempt to kill Mary. Through a freak occurrence, Mary ends up decapitating Satan and is immediately proclaimed Queen of Hell. She takes up residence in apartment 666 and life goes on. Bibbs wasn’t as lucky as her character, as she was quickly committed to a mental institution, living out the rest of her sad life in a padded cell. When game show wunderkind Louis Corvin sold The $66,600 Question to CBS in 1955, he’d only been in our plane of existence for two hours. Seven separate witnesses said they saw Corvin “step out of nothingness, just materialize right there on the street.” Soon after, the seven witnesses were either dead or confined to an institution. None of the bizarreness surrounding Corvin’s arrival in Los Angeles stopped him from pushing forward with Question, making it the highest rated show in the country. No show would get close to those ratings until Mister Dead debuted in 1961. The $66,600 Question was a game show, but one unlike any that came before it, literally asking contestants to save themselves from certain death. Each contestant would first chose a subject category (such as “Dismemberment”, “Torture”, or “Pain”) from the Catastrophe Board. Then Corvin, who insisted on serving as the show’s host, would ask questions on that category. (Sample question from “Dismemberment” category: “How many limbs can a normal person lose before passing out from loss of blood?”) Most contestants seemed intensely uncomfortable and therefore never got to the final round. Many seemed upset by the questions being asked, but even more were disturbed by Corvin’s intense manner, where he would occasionally stare at the contestants for up to a full minute before asking a question. In the background, a solitary clock ticked loudly. Sometimes Corvin would remark, “It’s counting down to your death” and then laugh heartily while the contestants squirmed in their seats; most of them never made it to the final round. When someone succeeded in answering the final question correctly, usually with spiders up around their shoulders, Corvin issued a guttural moan, causing the spiders or scorpions to crawl ever higher, until the contestant was completely covered. The booth would fill with green smoke and the contestant would disappear. Upon returning from commercial, Corvin could be seen standing next to the dead-eyed contestant, who had begun to drool. Corvin would wish contestants a happy week and demand they tune in next week, for fear of losing those close to them. 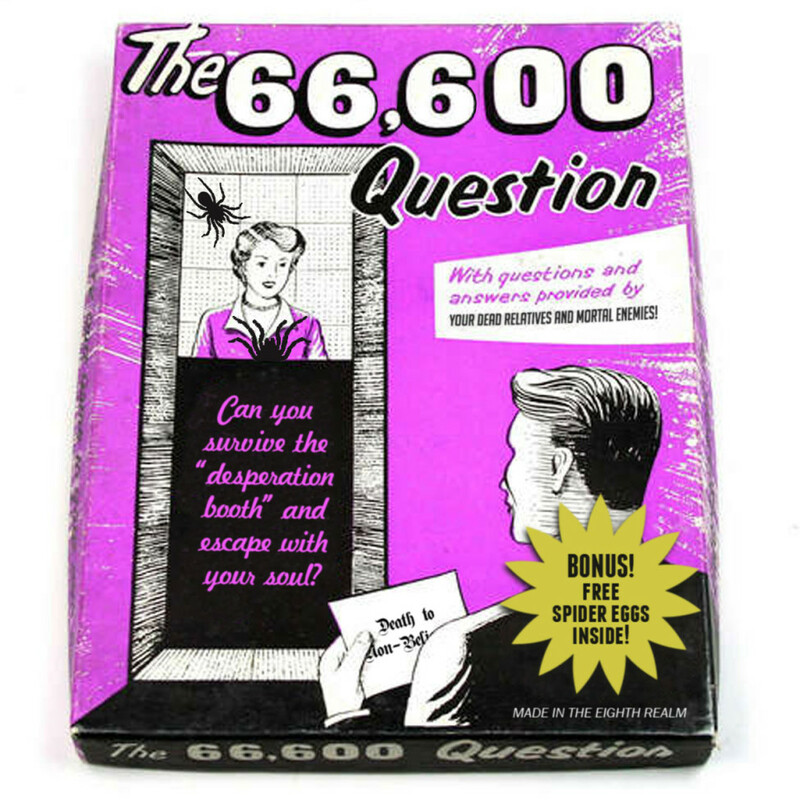 Corvin was the creator of multiple hit game shows (This Is Your Death, I’ve Got a Dark Secret, and The Newly-Dead Game, among others), but none were as popular as The $66,600 Question. As the show’s popularity waned, and the contestant pool dried up, Corvin became erratic and looked more run-down with each episode of the show (he continued to host until the final episode). As he aged rapidly, more people tuned out and eventually no one was watching. Insiders say that Corvin would mumble about “the cleansing fire” and the “eighth realm” while eating his lunch. One afternoon, Corvin reportedly wandered back to where he’d supposedly appeared all those years ago and vanished without a trace. A homeless man who was watching said only he saw a bright light and then darkness; his eyes had been melted from his skull. Starting in late 1957, Leave It To Cleaver followed an inquisitive but often naïve young murderer named Theodore “Cleaver” Weaver (played by Terry Scabbers) and his adventures at home, in school, and around his suburban neighborhood while tracking potential victims. The show also featured Cleaver’s parents, June and Ward Weaver, two serial killers who’d evaded capture for many years and taught The Cleaver the tricks of the trade. Beaver’s brother Wally was also a budding killer and had a thing for blonds. There had been many murder-centric shows before “Cleaver,” but none told from the point-of-view of a young murderer, which added to the uniqueness. 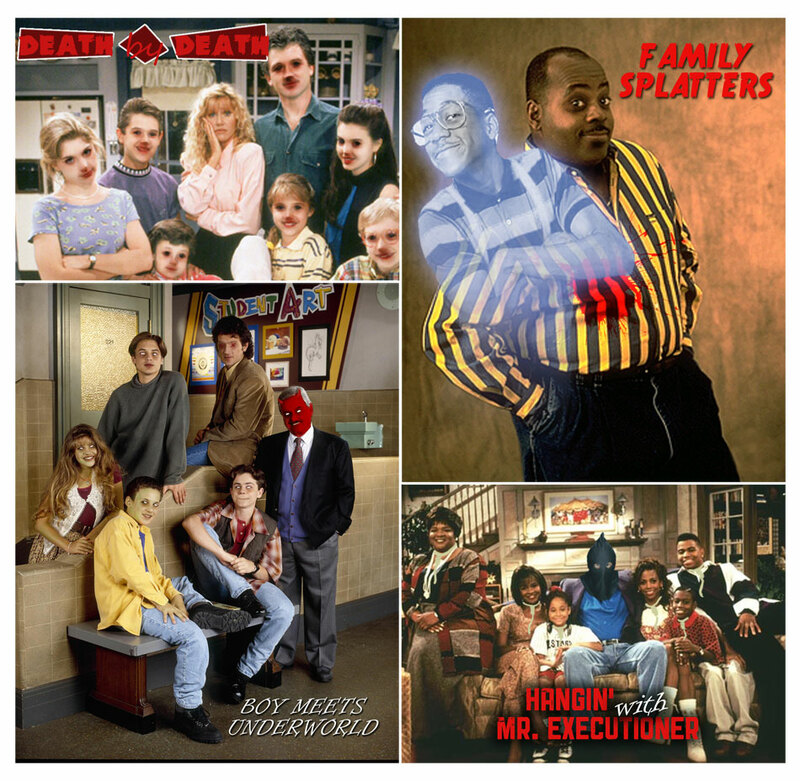 Most episodes focused on Cleaver getting into some sort of trouble while stalking a victim and asking his murderer parents for help in disposing of the body and eliminating any witnesses. A few years after the show ended production, Scabbers ended up in the news after he was accused of murdering Cleaver producer Joseph Donnelly. A few days before his death, Donnelly had called into a radio program, obviously drunk, promising to reveal a huge secret about Cleaver the next week. Before he could do so, he was found stabbed to death outside his Los Angeles apartment, his body folded in half and hidden in a dumpster. Neighbors revealed they’d seen Donnelly and Scabbers fighting just before the murder and Scabbers was taken in for questioning. During the investigation, the secret that Donnelly was planning to reveal came out: Scabbers was actually much older than he publicly claimed. Scabbers was almost 40 when he was found guilty of Donnelly’s murder, even though he looked no older than 13. After his sentencing, repeats of Cleaver were pulled from the airwaves and all merchandising ceased. Scabbers received many fan letters during his prison stay and was working on a script for a Leave It To Cleaver revival series, with some producers supposedly interested. Sadly, the script never materialized before he was choked to death by another inmate in the shower. He was 52. He looked 16. Mister Dead was a cultural phenomenon when it first debuted in 1961. By all accounts, it was a terrible show, with bizarre set pieces and a horrible horned horse as its host. The horse’s guttural voice was incredibly unpleasant to listen to, sounding like broken glass and gravel being slowly ground into powder. No studio notes ever listed who provided the voice for the host. They only listed, comically, “Mister Dead as Himself.” He would command his audience at home to watch the screen closely and be prepared for the coming darkness. The horse host would then stare intently at the camera for several minutes while his elfin assistant Willard wandered around in the background muttering to himself. Despite its weird premise, millions tuned in weekly, making it the highest rated show in the country. Even more strange, after each new episode, 13 random people died under unusual circumstances. The next week, those 13 names were shown and Mister Dead called them his disciples, cackling madly as the lights in the studio were turned down, leaving the horned horse enveloped in blackness, with the exception of his blinding white, pupil-free eyes. Due to the show’s intense popularity, it’s no surprise an album was released a year later. “Straight from the Destroyer’s Mouth” is an exercise in patience for its entire 66 minute run-time. How they were able to include 66 minutes on one side of a record is still unknown, but despite the obvious technical achievement, there’s not enough here to fill 6 minutes. The tracks bleed into each other, consisting of Willard’s inane mumbling and Mister Dead’s haunting growling. The horse seems to be speaking in a foreign language that sounds a bit like ancient Aramaic. There was also an issue with the album’s pressing, which caused the record to heat up when brought near a religious establishment. 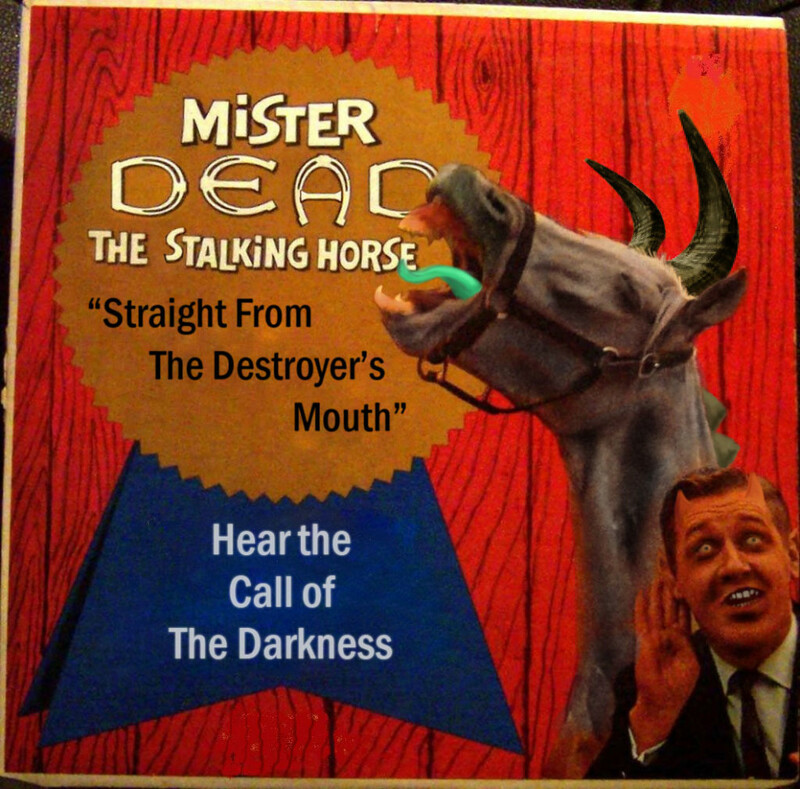 Sadly, the album didn’t get a chance to chart as it was quickly pulled from the shelves after the show was cancelled following the apparent murder-suicide of Mister Dead and Willard, which occurred shortly after the album’s release. It’s still unclear who wielded the shotgun. There’s word of a potential resurrection of the series and possibly another album. It’ll be intriguing to see what they keep from the previous incarnation and what they lose in order to make it more palatable for today’s audiences. Mister Dead will probably be riding a skateboard or something.